Life is filled with a lot of must-dos. One that is overlooked often is the importance of stretching. What are you doing to keep your body flexible? As much as you think cardio and muscular strength is important, so is keeping your body flexible. Desire to be supported and encourage by other like-minded women? Join us at Women of IMPACT. http://facebook.com/groups/thewomenofimpact Stretching increases your mobility and independence. When you get older, the last thing you want to do is lose ... Más informaciones either of those; mobility or independence. You don't want anything to hold you back. You've worked so hard to get where you are in your career and your family, is it worth sacrificing your longterm health? Of course not! So it's time for you to make your aging health a priority. Let's stretch it out. The K.I.S.S. ~ Stretch it out! How much of your day is sitting? Mine can be way too much if I'm not careful and intentional about my movement. For me personally, I stretch every day even if I don't workout. And when I don't stretch, oh boy do I feel it, especially at night. 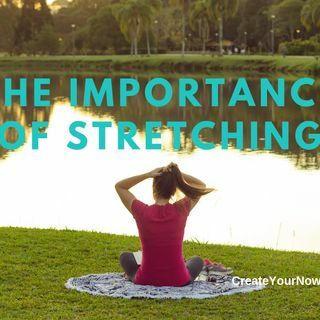 There are so many benefits to stretching (flexibility training): Reduces stress in your muscles worked during exercise. Releases the build-up of tension during exercise. Helps to improve posture. Reduces the risk of injury during exercise and daily living. Improves your overall strength as it increases your ROM. How good do you feel when your all tight? You don't, which in turn affects your mood and attitude. Who really wants to be limited by your tightness? Areas to stretch: Lower extremities: calves, hamstrings, hip flexors, and quadriceps (front of the thigh). Lower back Shoulders Neck Guidelines for stretching: Go slow. Work within your limits. Be sure to warm up (a brisk 5 minute walk). Breathe deeply. Smooth, slow, and steady. Focus on each muscle. Feel the tension and stress release. Hold the stretch for 10-30 seconds. Think of counting. Press into the stretch as tension releases. This will increase over time. Modify to fit your ability. Don't rush the process. Connect stretching with your meditation. "Stretch out your day. You'll feel better and your day will go smoother." #WellnessWednesday #CreateYourNow #HealthAndWellness TAKE A.I.M. ~ Action Ignites Motivation - This is a complimentary (FREE) coaching call with me. You will be able to discuss your specific situation and gain tools and strategies to move you forward. Live. Love. IMPACT! "One step at a time leads to miles of greatness!" Subscribe to Create Your Now TV on YouTube. Wanting help with goals, setting your schedule, or need someone to talk to (even if you don't know what you need)? It's time you TAKE A.I.M. ~ Action Ignites Motivation. This is FREE for you. Stop trying to do it by yourself. Put YOU first! Become your best selfie so you can live your life's purpose. ANNOUNCEMENT: Ready to shine your light and tell your story. Please click on MY STRENGTH IS MY STORY. Here you can submit yourself to appear on the podcast or make recommendations as who you would like to hear. This is going to be a beautiful series! Subscribe to Create Your Now TV on YouTube. Listen to Create Your Now on Spotify. Listen to Create Your Now on iHeart Radio. Click here. The Create Your Now Archives are LIVE!! You can subscribe and listen to all the previous episodes here. http://bit.ly/CYNarchive1 and http://bit.ly/CYNarchive2 and http://bit.ly/CYNarchive3 and http://bit.ly/CYNarchive4 and http://bit.ly/CYNarchive5 Contact me at YourBestSelfie@CreateYourNow.com THE NO FUSS MEAL PLAN Instagram @CreateYourNow @Kristianne Wargo Twitter @KristianneWargo @CreateYourNow Facebook www.facebook.com/TheKISSCoach www.facebook.com/CreateYourNow PERISCOPE USERS!!! Click here for ANDROID Users / GOOGLE https://play.google.com/store/apps/details?id=tv.periscope.android Click here for APPLE Users https://itunes.apple.com/app/id972909677 Read more from Kristianne, a contributor to The Huffington Post, MindBodyGreen, Thrive Global, Addicted2Succes, and She Owns It. https://addicted2success.com/success-advice/5-things-to-do-while-waiting-for-success-to-manifest-in-your-life/ http://www.huffingtonpost.com/kristianne-wargo/ http://bit.ly/9amHabits https://journal.thriveglobal.com/how-to-configure-a-sleep-pattern-fit-for-you-d8edd3387eaf#.sniv275c3 https://sheownsit.com/when-failure-is-your-middle-name/ DOMESTIC BEAUTIES (Announcements) 1. Come and let's connect on Facebook - Women Of IMPACT http://facebook.com/groups/thewomenofimpact 2. Create Your Now ~ Your Best Selfie can be heard on iHeart Radio and Spotify! 3. Create Your Now Archive 1 is LIVE! You can subscribe and listen to all the previous episodes here. http://bit.ly/CYNarchive1 4. Create Your Now Archive 2 is LIVE! You can subscribe and listen to all the previous episodes here. http://bit.ly/CYNarchive2 5. Create Your Now Archive 3 is LIVE! You can subscribe and listen to all the previous episodes here. http://bit.ly/CYNarchive3 6. Create Your Now Archive 4 is LIVE! You can subscribe and listen to all the previous episodes here. http://bit.ly/CYNarchive4 7. Create Your Now Archive 5 is LIVE! You can subscribe and listen to all the previous episodes here. http://bit.ly/CYNarchive5 8. NEW Website! Go check it out and tell me what you think. http://www.createyournow.com 9. Sign Up for The A.I.M. Academy! You will be the first to learn all about it. http://createyournow.com/m-academy-2 10. Schedule a Discovery Call. This is a free 30-45 minute call for those serious about coaching with me. 11. Newsletter and Library: If you desire to get weekly emails, be sure to sign up here so you can stay connected. http://createyournow.com/library Cover Art by Jenny Hamson Photo by Gabriel on Unsplash Music by Mandisa - Overcomer http://www.mandisaofficial.com Song ID: 68209 Song Title: Overcomer Writer(s): Ben Glover, Chris Stevens, David Garcia Copyright © 2013 Meaux Mercy (BMI) Moody Producer Music (BMI) 9t One Songs (ASCAP) Ariose Music (ASCAP) Universal Music - Brentwood Benson Publ. (ASCAP) D Soul Music (ASCAP) (adm. at CapitolCMGPublishing.com) All rights reserved. Used by permission.